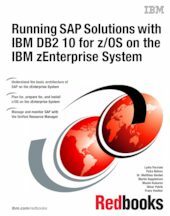 This IBM® Redbooks® publication highlights the key enhancements of IBM DB2® 10 for SAP. These enhancements include performance, scalability for several threads, new and more granular privileges, and auditing capabilities. This book is for IT specialists and architects who are interested in how SAP NetWeaver v7.3 interacts and uses the new features of DB2 10 for z/OS®. This book focuses on the SAP Business Suite of applications and how these applications run on IBM zEnterprise™ infrastructures. It begins with a brief overview of the SAP NetWeaver products and hardware and explains the software implementations when DB2 10 for z/OS is used as the database server. It highlights the SAP NetWeaver system architecture. It continues by describing how SAP products benefit from the recent developments by IBM on the hardware side with the zEnterprise 196 (z196) server, in z/OS, and in DB2 10 for z/OS. In addition, this Redbooks publication explains how you can extend an SAP system or change a server configuration by using the IBM zEnterprise Unified Resource Manager. It explores SAP high availability concepts, virtualization, and security enhancements of DB2 10 for SAP solutions.